In 2009, I had the great pleasure of meeting Jaden Hair at her book signing in New York City. Jaden is a fantastic cook, and the talented author of the popular blog Steamy Kitchen. With her huge smile and endearing personality, Jaden never fails to light up the room. Last week I was honored to contribute a guest post for Steamy Kitchen – and may I say, it was a thrill to create a recipe that would match both her personality and her gorgeous blog. Since Jaden and I both adore fresh, bold, colorful salads, I decided to create a summery one, using heirloom tomatoes, ripe avocados and baby arugula from my garden. The whole salad is drizzled with a spunky cilantro vinaigrette that’s almost like a cilantro pesto (the pine nuts give the dressing a lovely creaminess). Then the salad is garnished with crispy wonton strips that have been lightly sautéed in olive oil until they’re crunchy and golden-brown. Every bite is a delight, offering a marvelous array of flavors and textures. To read my guest post for Jaden, click here. While you’re there, make sure to take a few minutes to peruse Jaden’s site. It’s filled with treasures that you’ll love to discover. How about serving an aromatic white like a Grüner Veltliner from Austria, Slovakia or Czech Republic? The best examples of this varietal deliver full-bodied, perfumed wines with peppery notes that are a delight to sip. My second recommendation for this flavor-packed salad would be a dry rosé. 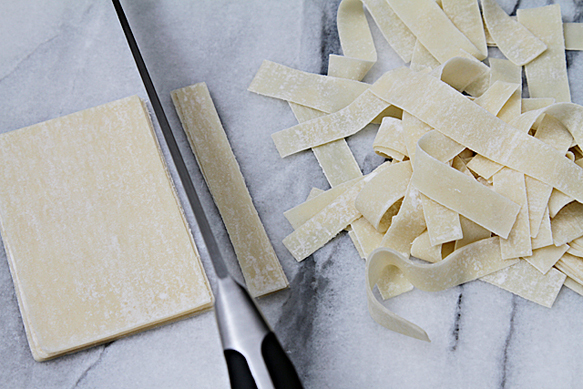 Step 1: Cut the wontons in 1/4″ strips. Heat a large frying pan at medium-high heat. Add the olive oil and wonton strips. 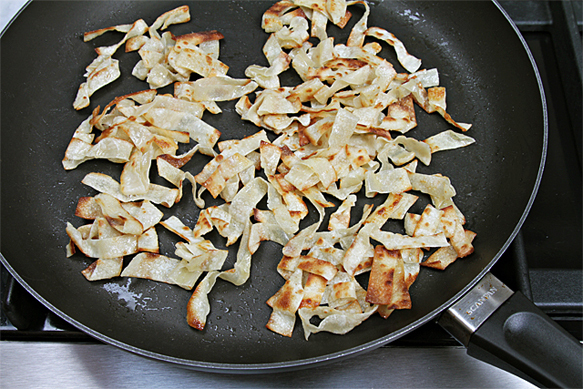 Toss well, then sauté for 2 to 3 minutes until they become golden-brown, continuing to toss occasionally. Transfer wontons to a paper towel and sprinkle with the salt. 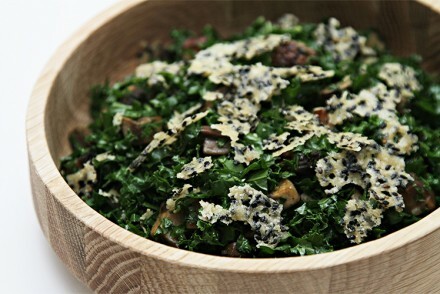 Step 2: To make the vinaigrette – Place all the ingredients in the bowl of a food processor. Process until creamy, about 1 minute, scraping the sides of the bowl once. Transfer to a small bowl. Step 3: Divide the arugula into 4 salad bowls. 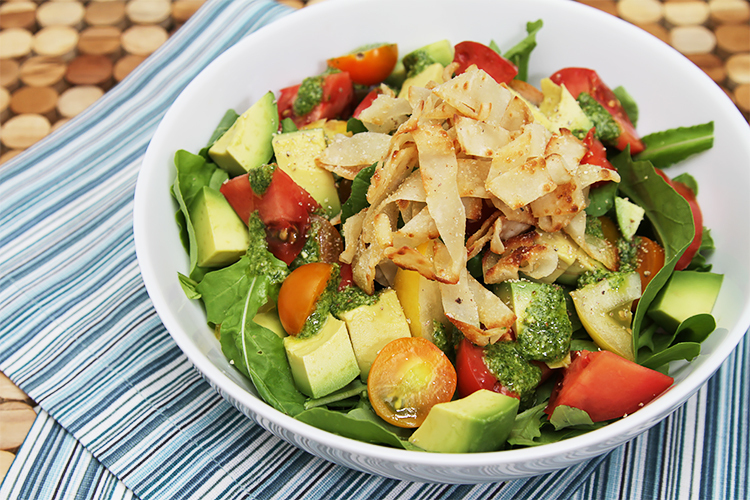 Top with the avocado and tomato pieces. Drizzle with the vinaigrette. Garnish with the crispy wontons. Sprinkle with the pepper and serve immediately. 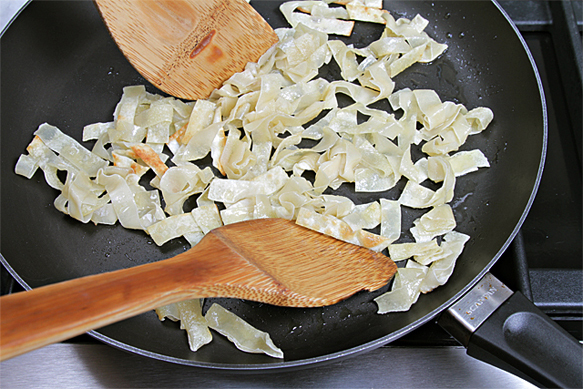 Cut the wontons in 1/4″ strips. Heat a large frying pan at medium-high heat. 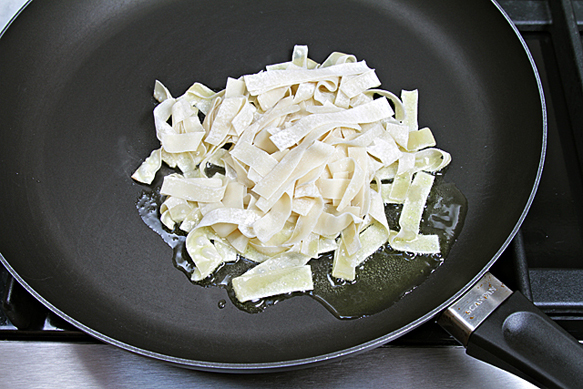 Add the olive oil and wonton strips. 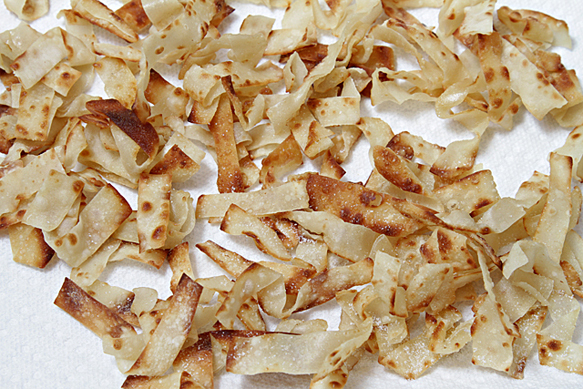 Toss well, then sauté for 2 to 3 minutes until they become golden-brown, continuing to toss occasionally. This is how the wontons look when they are done. Transfer wontons to a paper towel and sprinkle with the salt. 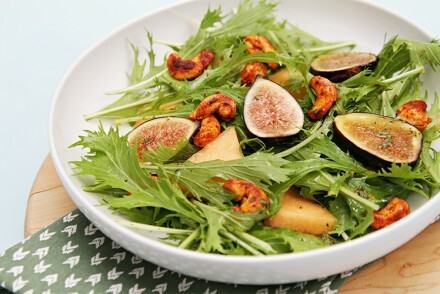 Another fabulous salad! 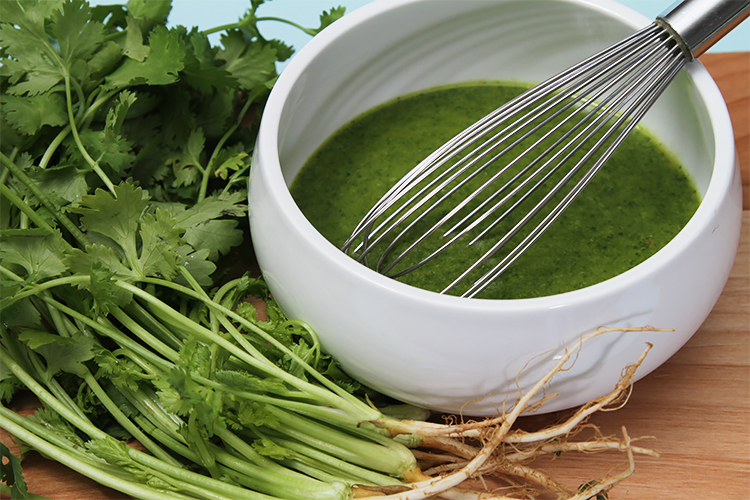 the vinaigrette with the cilantro sounds quite good and something we would love in this house! Love the way the fried wontons add a touch of crispiness to the salad, something every salad should have. Great recipe Viviane and beautiful photo’s! I look forward to reading your guest post! Yummy. My family would be over the moon for this vinaigrette…..such a great mix of flavors. A very big thank you to everyone for your wonderful comments – Smiling from ear to ear! The flavors sound perfect…and the photos are gorgeous! 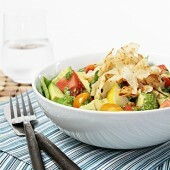 I’ll have to make this soon, I’ve been craving avocados as of late…and cilantro is in the fridge, begging to be used. I have some extra wonton wrappers from making raviolis and I needed a recipe to use them for…this look absolutely phenomenal!! Thank you for sharing! Great post so many delicious details, and how to photos! This looks amazing! The pictures and food are gorgeous! Wow, this looks so good! And the vinaigrette… I’ll definitely be making that soon! 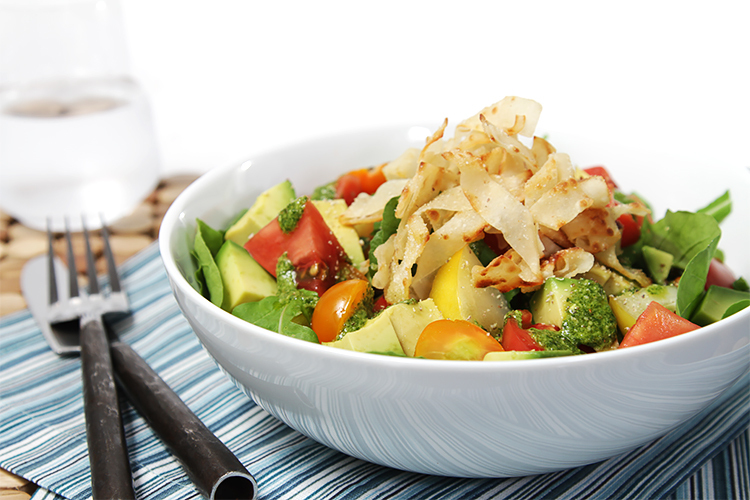 I really like the ingredients in this salad and the crispy wontons are a great touch. Glad you got a guest post over at Jaden’s-I will pop over there and take a look. I love cilantro. A lot actually. I put it into a lot of foods. I like the crispy wontons on top. That must taste really great. beautiful post, great pictures and i love the idea of adding crispy wontons on top. thanks for sharing! This really looks fantastic, I love how colorful and refreshing it looks..just perfect for summer light dinner..Congrats on the guest post..I will check it out for sure! Have a wonderful weekend! Thank you so much Sandra! I hope you enjoyed Jaden’s blog and had a delicious weekend to boot! 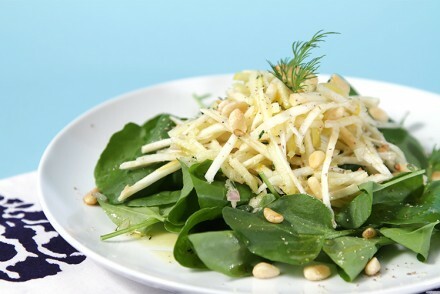 This salad sounds so perfect for summer! The cilantro vinaigrette sounds just as delicious – and I think I would want to drizzle it on everything from vegetables to pizza! Peggy! Thank you so much for your comment. You’re right, the cilantro vinaigrette is luscious and delicious on its own. It’s fabulous with grilled veggies, but I hadn’t thought about drizzling it on pizza – you’re inspired!